The colors of fall are always a relief from the constant green of summer. 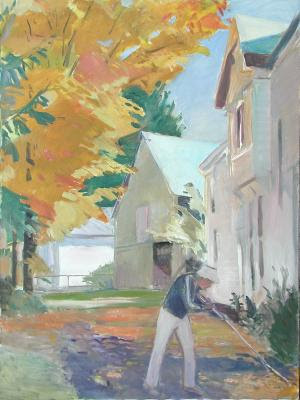 As I worked on this fairly large painting of the scene across the street from my studio, I remember purposely keeping the shapes of color uncomplicated by detail – reminiscent of Fairfield Porter. I waited for afternoon light so that the roofs would be lit along with a patch of light on the farthest building. And it was fun to juxtapose the colors of the bright fall leaves with the subtler grays of the white house in shadow.